By switching the skid control ecu from normal mode to test mode, abnormality detection sensitivity is enhanced and troubleshooting can be conducted efficiently. Perform a sensor check in test mode after the speed sensor or sensor rotor has been repaired or replaced. 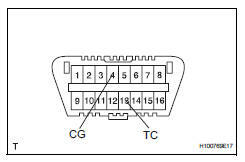 If the ignition switch is turned from on to acc or off during test mode, dtcs related to the signal check function will be erased. 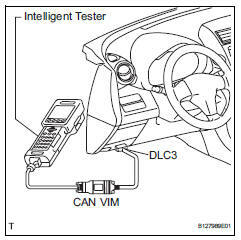 During test mode, the skid control ecu stores all dtcs related to the signal check function, and the dtcs are erased if normality is confirmed. Any remaining dtcs are those indicating abnormalities that were found. Check that the steering wheel is in the centered position. Set the intelligent tester to test mode (select "signal check"). Check that the abs warning light and vsc warning light blink as shown in the illustration. 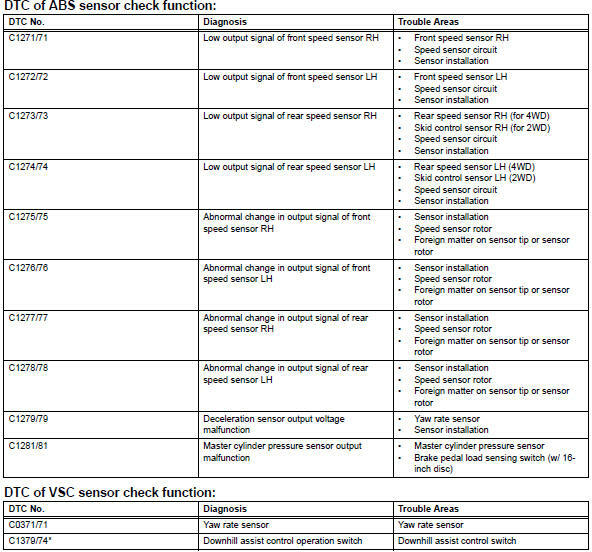 If the abs warning light and vsc warning warning light do not blink, check the ts and cg terminal circuit, and abs and vsc warning light circuits. W/ 16-inch disc only: check the lost booster pressure judgment and perform the master cylinder pressure sensor zero point calibration. Preform the check in the lost booster pressure state (negative pressure in the booster is depressurized). Start the engine depressing the brake pedal with a force of 59 n (6 kgf, 13.2 Lbf) or more for 1 second or more. If you slowly depress the brake pedal or depress it again, master cylinder pressure sensor zero point calibration is not performed normally. Keep the vehicle stationary on a level surface for 1 second or more. The deceleration sensor check can be performed together with the following master cylinder pressure sensor check. Check the master cylinder pressure sensor. Leave the vehicle in a stationary condition and release the brake pedal for 1 second or more, and quickly depress the brake pedal with a force of 98 n (10 kgf, 22 lbf) or more for 1 second. Check that the abs warning light remains illuminated for 3 seconds. While the abs warning light remains illuminated, continue depressing the brake pedal with a force of 98 n (10 kgf, 22 lbf) or more. Drive the vehicle straight forward at a speed of 45 km/h (28 mph) or more for several seconds. Check that the abs warning light goes off. 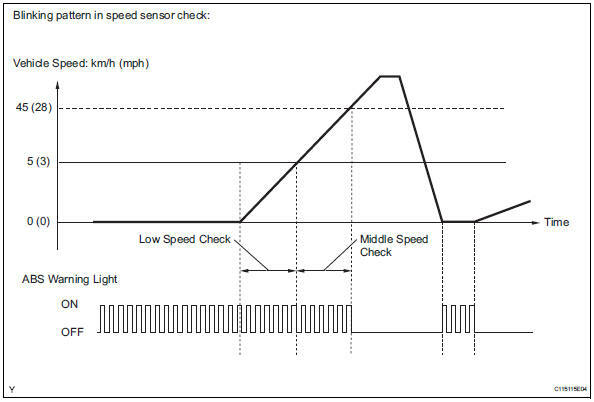 If the speed sensor check is commenced while the steering wheel is turned, the abs warning light may come on after the low speed check is finished. 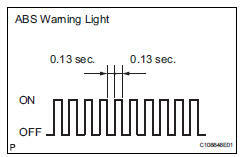 The abs warning light comes on immediately when an abnormality is detected. When the speed sensor signal is normal, the abs warning light goes off while driving at 45 km/h (28 mph) or more, and blinks in the test mode pattern while the vehicle is stationary. Do not drive the vehicle at a speed of 80 km/h (50 mph) or more after the abs warning light turns off, because test mode dtcs are set again when the vehicle speed exceeds 80 km/h (50 mph). Check the yaw rate sensor. Move the shift lever to p and set the parking brake lever. Check that the vsc warning light is blinking as shown in the illustration. Shift the shift lever to the d position and drive the vehicle at a speed of approximately 5 km/h (3 mph), and turn the steering wheel either to the left or right 90° or more to turn the vehicle through 180°. Stop the vehicle, move the shift lever into the p position, and then apply the parking brake. Check that the skid control buzzer sounds for 3 seconds. If the skid control buzzer sounds, the signal check has been completed normally. 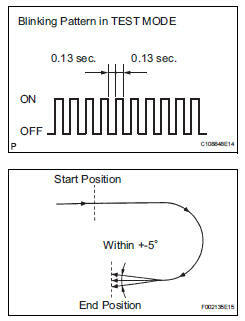 If the skid control buzzer does not sound, check the skid control buzzer circuit (see page bc-172). Drive the vehicle in a 180° semi circle. 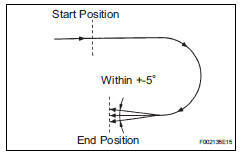 At the end of the turn, the direction of the vehicle should be within 180 +-5° of its start position. Complete the vehicle turn within 20 seconds. Do not spin the wheels. Check the downhill assist control operation switch. Check the downhill assist control switch. 1. Push the downhill assist control switch on. 2. Push the downhill assist control switch off. Check that the auto lsd light illuminates only when the auto lsd switch is pressed. Check the end of sensor. When the sensor check is successfully completed, the abs warning light blinks in the test mode pattern when the vehicle is stopped, and goes off when the vehicle is driven. If the sensor check is not completed, the abs warning light blinks even while the vehicle is driving and the abs does not operate. 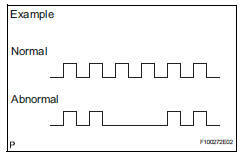 Read the dtcs of signal check function. Read the dtc(s) by following the instructions on the tester screen. If only the dtcs are displayed, repair the malfunction area and clear the dtcs. If the dtcs or test mode codes (dtc of signal check function) are displayed, repair the malfunction area, clear the dtcs and perform the test mode inspection. See the list of the dtcs (refer to "dtc of test mode function (signal check)" below). If the abs warning light and vsc warning warning light and multi information display and master caution indicator light do not blink, check the ts and cg terminal circuit, and abs and vsc warning light circuits. Check the lost booster pressure judgment and perform the master cylinder pressure sensor zero point calibration. 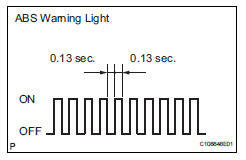 Check that the abs warning light is blinking as shown in the illustration. Check the speed sensor signal. 1. Drive the vehicle straight forward at a speed of 45 km/h (28 mph) or more for several seconds. 2. Check that the abs warning light goes off. If the skid control buzzer still does not sound, there is a malfunction in the yaw rate sensor, so check for dtcs. Check the end of the sensor. Read the dtcs of the signal check function. Count the number of blinks of the abs and vsc warning light. 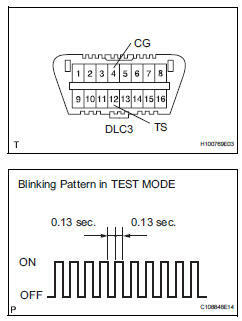 As an example, the blinking patters of dtcs 71 and 74 are shown below. If only dtcs are displayed, repair the malfunctioning area and clear the dtcs. 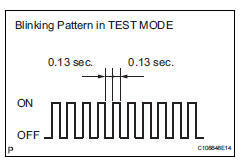 See the list of dtcs (refer to "dtc of test mode function (signal check)" below). If all sensors are normal, a normal system code is output (the light comes on for 0.25 Seconds at intervals of 0.25 Seconds). After the check, disconnect sst from terminals 13 (tc) and 4 (cg) of the dlc3. The dtcs in this table are only output in test mode. The detection of dtcs from c1271/71 to c1274/74 is completed before the vehicle speed reaches 5 km/h (3 mph). The detection of dtcs from c1275/75 to c1278/78 is completed before the vehicle speed reaches 45 km/h (28 mph). C1271/71 to c1274/74: the speed output from only one wheel is extremely low despite other wheel speed outputs reaching 5 km/h (3 mph). 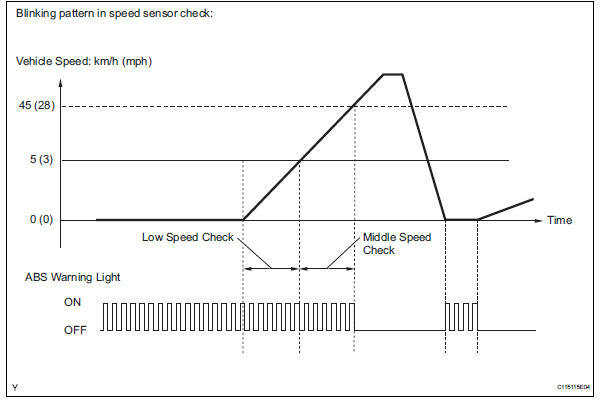 C1275/75 to c1278/78: the abnormal speed sensor Output frequency is as shown in the illustration.